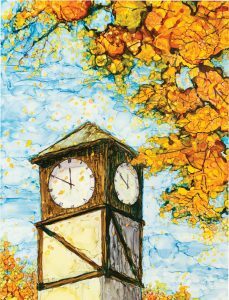 Highland City Hall Clock Tower: Reprint of original artwork by Patricia Ballwin using alcohol inks on tiles. 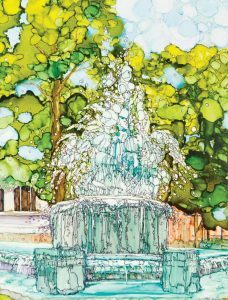 Highland Fountain on the Square: Reprint from original artwork by Patricia Ballwin using alcohol inks on tiles. 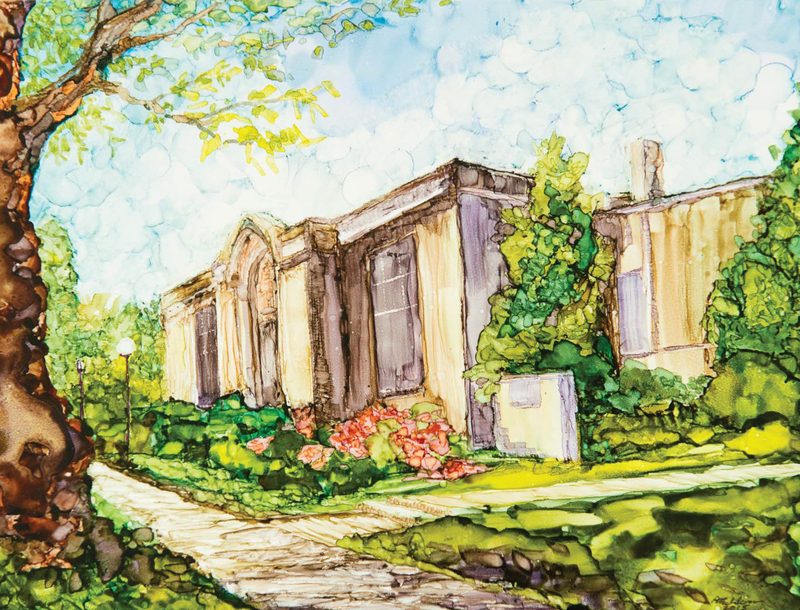 Louis Latzer Memorial Library, Highland, IL: Reprint of original artwork by Patricia Ballwin using alcohol inks on tiles. 2 each of above reproductions by artist, Patricia Ballwin. The profits from the sale help the Treehouse Arts Gallery. Patricia Baldwin, an artist from Dixon, Illinois, demonstrated alcohol inks on glazed tiles at Art in the Park in Highland, Illinois. Her subjects were icons for Highland residents…the fountain at the Square, the clock tower on City Hall, and the Louis Latzer Memorial Library. Instead of placing the tiles in a location to share with the residents, the Highland Arts Council created notecards to share her art. Everyone will be able to purchase 6 notecards and envelopes replicating these icons during Art in the Park on Saturday and Sunday, October 13 - 15, 2017 at Lindendale Park in Highland. Your purchase of the cards will help Highland Arts Council continue its mission of encouraging the arts in Highland and the surrounding area and share this beautiful community’s landmarks with others. The creation of this commissioned artwork was made possible and partly funded by the Monsanto Rural Community Arts Program through the Arts & Education Council of St. Louis. The Highland Arts Council is grateful to them for honoring us with this grant.